In addition to the National Planning Excellence Awards presented this year, the awards jury selected 12 Achievement Award recipients as examples of good planning work. The Achievement recipients are recognized collectively at the awards luncheon held during APA's National Planning Conference. In 2009, the Commonwealth of Virginia established a program to help communities plan for future growth by designating certain communities as Urban Development Areas (UDAs) — areas of higher density development that are walkable and offer a mix of uses. The program was aimed at promoting economic development and improving coordination between transportation and land-use planning. The commonwealth implemented a grant program to provide professional planning assistance and consulting services to communities with small staffs and little or no budget for planning initiatives. Grants range from $65,000 to $120,000, depending on jurisdiction size and whether a UDA is in place. The program educates decision makers and planning officials on the tools and strategies needed to effectively accommodate targeted growth without negatively impacting the essential character of UDAs, many of which are historic or rural in nature. The program also links the land-use and transportation planning processes by providing incentives and additional opportunities for funding. Since the UDA legislation was enacted, 50 jurisdictions have received technical assistance grants totaling nearly $3.6 million, and another 33 have pending grant approvals. In downtown South Boston, Virginia, this rendering envisions a proposed central public space with a farmer's market as part of UDA planning assistance. Image courtesy Commonwealth of Virginia. When the Los Angeles Neighborhood Land Trust set out to create a senior-friendly public park adjacent to a senior center in a densely populated, low-income neighborhood, there were few public facilities that met the needs of a growing aging population and very little information about how to design them. People over age 65 are underserved by public parks, yet they represent the fastest growing and most inactive segment of the population. 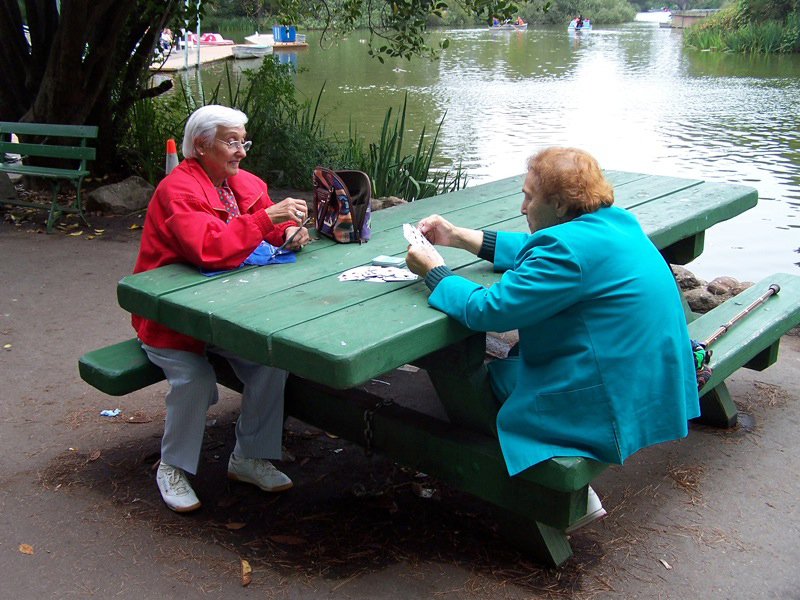 To prepare the Guidelines for Senior-Friendly Parks, planners reviewed best practices, interviewed experts and policy makers, and facilitated focus groups with various senior groups to learn which park features were most important. Many seniors reported that they wanted a safe and appealing space to engage in healthy physical activity. The guidelines describe 10 purposes or outcomes that senior-friendly open spaces should address: control, choice, safety and security, accessibility, social support, physical activity, privacy, contact with nature, comfort, and aesthetic and sensory delight. These purposes should be easily achievable at minimal expense and would be useful and accessible for people of all ages and abilities. These guidelines were used by designers in the development of the first senior-focused park in Los Angeles, set to open in the fall of 2017. People over age 65 are underserved by public parks, yet they represent the fastest growing and most inactive segment of the population. Photo courtesy UCLA Luskin School of Public Affairs. Adopted by the Ford Ord Reuse Authority in 2016, the Fort Ord Regional Urban Design Guidelines outline reuse plans for the 28,000-acre historic Fort Ord military installation located along Monterey Bay in California. The guidelines serve as a model for combining sound urban design principles with significant public involvement to implement the community's vision. Adoption of the guidelines concluded a two-year public development process. Multilingual outreach included social media, educational forums, interactive online tools, and a dynamic web design to collect input about the guidelines and encourage community involvement in the planning process. More than 1,200 people participated in special topic meetings, design sessions, and open studio visits. Public feedback influenced the project outcomes related to walkable street design, integrated transit planning, and placemaking. The project integrated urban design and planning best practices, such as street connectivity, well-oriented buildings, properly scaled public spaces, mix of building types, identifiable centers, customized gateways, and context-sensitive trails. The Ford Ord Guidelines process serves as a best practice model for large area, complex public planning processes anywhere. A future vision of Broadway Avenue at the Fort Ord National Monument in California. 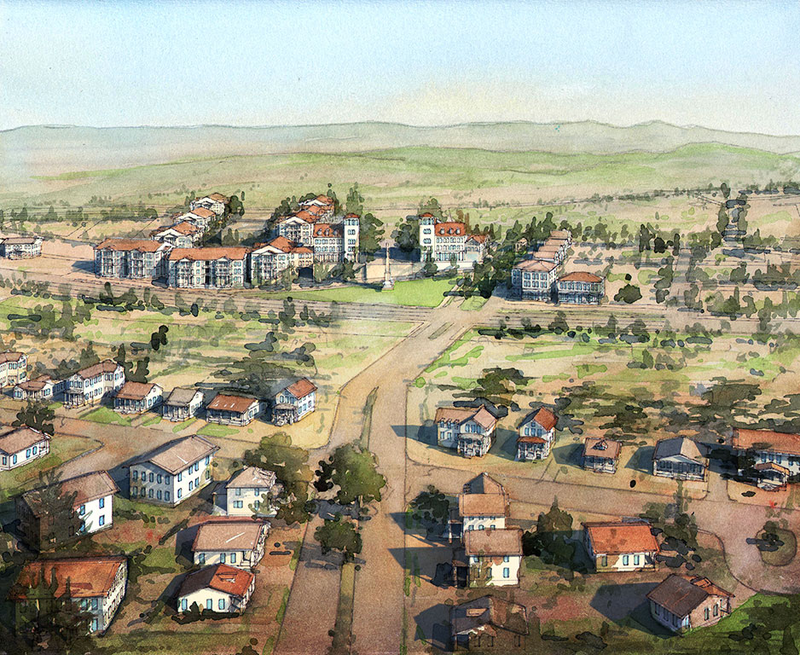 Rendering courtesy Fort Ord Reuse Authority. Indianapolis's Plan 2020 places the long-term, values-driven vision outside of city government and invites city partners to be more involved in planning the city's future. It aims to leverage the full planning and implementation capacity of Marion County, Indiana's diverse population of residents, civic leaders, and businesses. The decentralized process is possible as nonprofit and philanthropic groups have more resources and capabilities that contribute to the city's planning efforts, and new technologies make it possible for planners to communicate with the public. Plan2020.com celebrates the progress of all partners and maintains transparency and accountability to the public. Indyvitals.org is a neighbor-based data tool that measures the impact of Plan 2020 at the neighborhood level and highlights key needs and challenges that each neighborhood faces. Plan 2020 comprises seven interrelated plans, including the updated thoroughfare plan, county-wide land-use plan, downtown plan, parks master plan, and a regional comprehensive economic development strategy. Plan 2020 shows how city planning can work as a decentralized operation, making it more relevant to more players, guiding more investments, and coordinating more activities than a traditional public planning process. 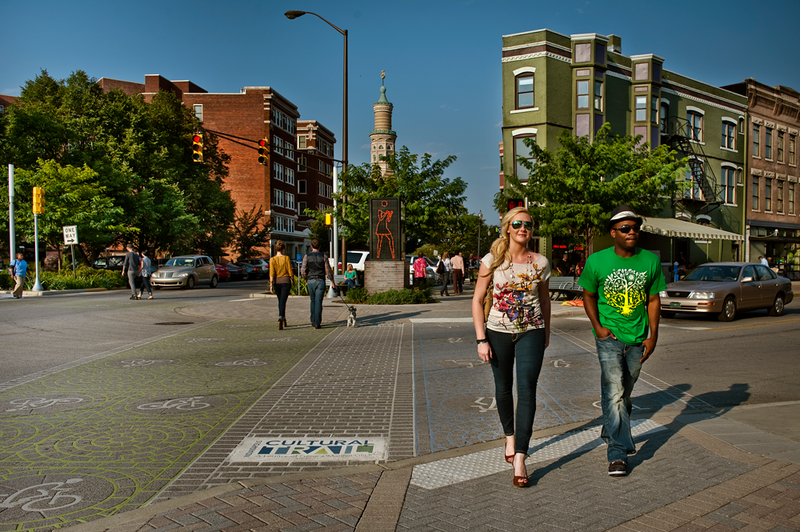 The Indianapolis Cultural Trail is the spine for central Indiana's growing greenway system. Its seamless connectivity to neighborhoods and cultural districts spans across eight miles in the heart of the city. Photo courtesy City of Indianapolis. Formerly an area with light manufacturing and warehouses, the Wynwood District in Miami has been transformed into a diverse, 24-hour mixed-use arts neighborhood with walkable streets, transit corridors, and green space. The Neighborhood Revitalization District (NRD) designation led by the Wynwood Business Improvement District focuses on redeveloping the area with new public and private open spaces and accommodating a mix of uses. Zoning changes are helping to steer development to create a more livable, smaller, more affordable district encouraging micro-unit apartments and live-work units that appeal to millennials and artists. Zoning also introduced "manufacturing-enabled" retail use, to maintain the industrial heritage by finding compatible goods manufacturing at facilities with on-site retail sales and amenable to the vertical integration of other uses. A transfer development rights program as well as a strong incentive program has boosted property values while providing open space and affordable housing to the creative class and preserving working class jobs. The plan also sets up a system allowing developers to contribute to a fund that will be used to build centralized parking garages and offset the expense of on-site parking. The Wynwood Neighborhood Revitalization District plan balances the needs of remaining light industry, the growing arts district, and future residential and commercial uses. 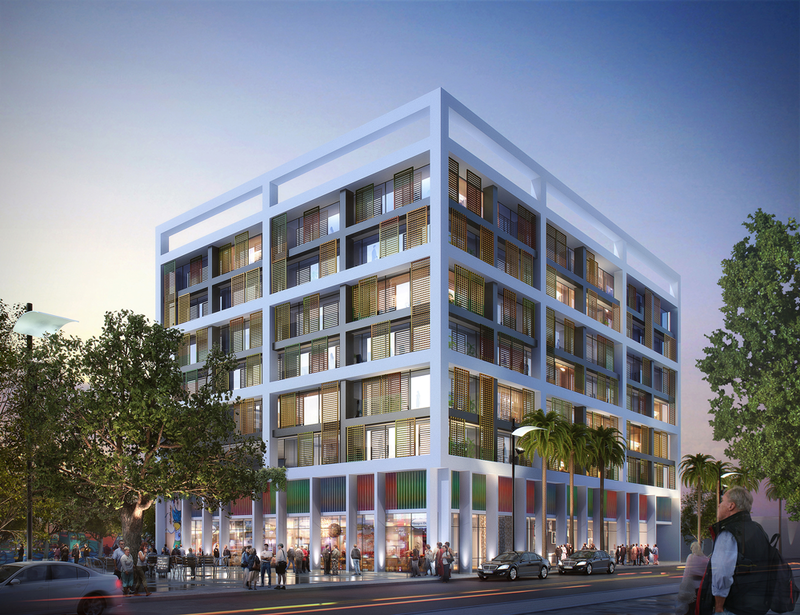 The Neighborhood Revitalization District economic development planning effort was strongly embraced by Wynwood investors and influenced the design of new buildings under the adopted regulations. Image courtesy PlusUrbia Design. Following a devastating flood in 2013 that affected 24 counties and several wildfires that destroyed nearly 1,250 homes, the state of Colorado recognized the need for a comprehensive resiliency strategy to enable communities to rebound after natural and man-made disasters. The Colorado Resiliency and Recovery Office (CRRO) worked with federal, state, and local agencies; private organizations; and consultants to create the Colorado Resiliency Framework. The framework guides the state's actions and identifies five goals to increase disaster recovery: reduce risk, enhance planning, improve policy-making, create a more responsible culture, and incorporate resiliency into investments. Different from traditional risk reduction programs, the systematic and regional approach addresses risk from natural hazards and vulnerability from social, economic, and environmental stresses. And by viewing resiliency through six sectors — community, economic, health and social, housing, infrastructure, and watersheds and natural resources — CRRO planners are able to address the physical and human aspects of resiliency, such as healthcare, mental health, and socioeconomic support systems that may impact recovery. The online resource center provides access to various tools for resiliency planning, such as training modules, webinars, case studies, and templates, and serves as a model for other states in the country. 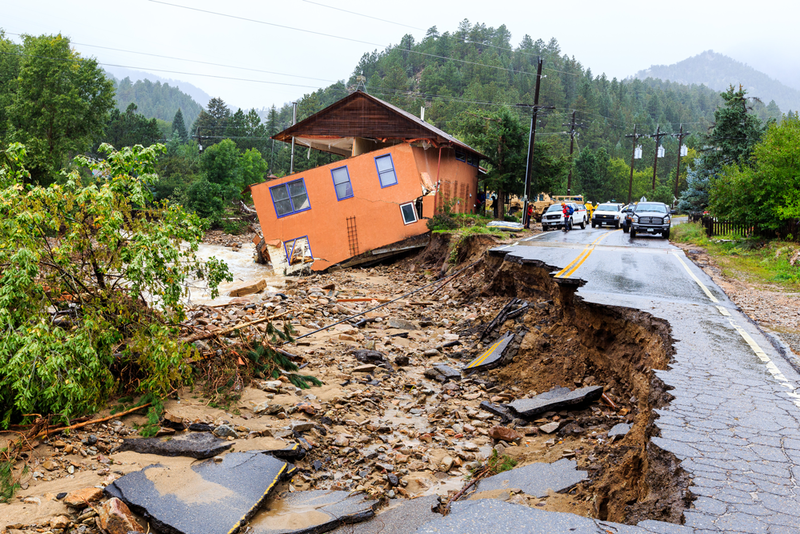 Major flooding in September 2013 impacted 24 Colorado counties and caused nearly $4 billion in damage. The governor was prompted to launch the Colorado Resiliency and Recovery Office (CRRO), which has guided resiliency actions throughout the state. Photo courtesy Colorado Resiliency and Recovery Office. Like many riverfront mill towns, Millvale, Pennsylvania, lost business and population as industry declined in the region. The town was further challenged by a history of flooding, poor air quality, and its reputation as a food desert — all factors that threatened the well-being of its residents. Through meetings, focus groups, and games, residents shared ideas and provided feedback about Millvale's future. Their comments were incorporated into the Ecodistrict Pivot Plan, which is designed to integrate placemaking and sustainability initiatives and make the Ecodistrict part of Millvale's identity and culture. The plan addresses six categories — energy, water, food, mobility, air, and equity. It has been instrumental in improving residents' quality of life and changing the perception of water from a liability to an asset — spurring construction of rain gardens and plans for green infrastructure for roads. The Millvale Community Development Corporation received over $1 million in funding to construct a food hub to address the town's food desert status, and the town also received funding to improve air quality. The Ecodistrict Pivot Plan demonstrates how sustainability can contribute to a vibrant, affordable, functional, and equitable community. Projects throughout Millvale's Town Center and River District improve mobility, access to fresh food, and economic vitality. 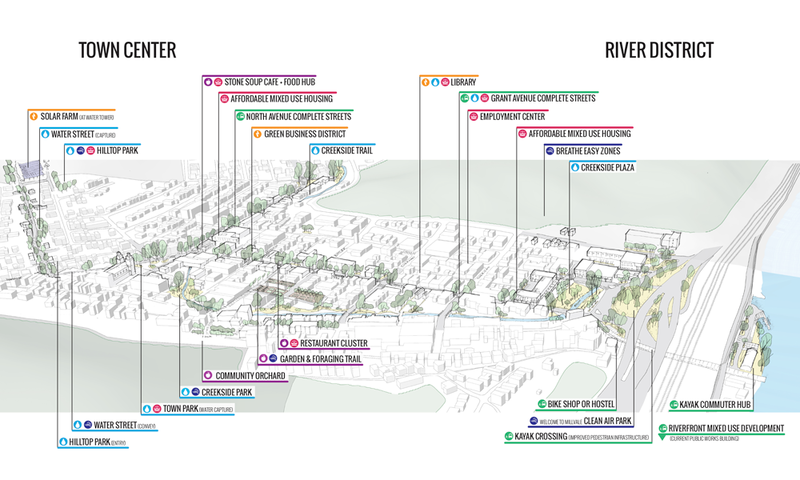 A diagram of the Millvale Ecodistrict showing how the plan will impact the River District and Town Center. Photo courtesy Evolve | environment:: architecture. Local residents were involved in the entire planning process — from selecting designs, presenting the project to the city's planning department, and clearing and plotting the land to maintaining the garden. The garden opened in September 2013 and features 68 family plots and 2.5 acres of agricultural land that produces 6,000 pounds of food annually. The land-use agreement between Pitzer College and the City of Ontario, California, allowed the community to repurpose vacant land into an equitable and sustainable community garden. Photo courtesy Huerta del Valle Community Garden. 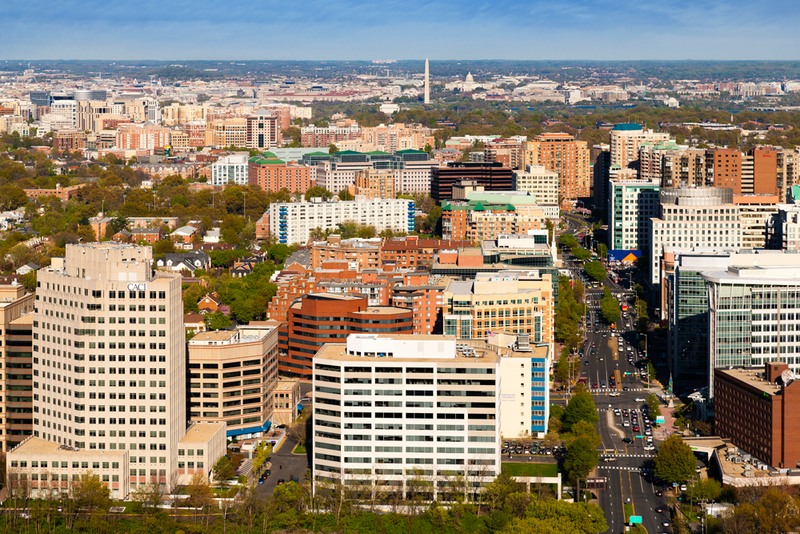 For more than 50 years, Arlington County's General Land Use Plan has served as a guide for the county's smart growth journey. During this period, the Virginia county has transitioned from a suburban, auto-centric collection of neighborhoods to one of the country's most recognized examples of smart-growth, sustainable, and transit-oriented development while reducing commercial sprawl and conserving the quality and diversity of neighborhoods. Arlington County, home to more than 222,800 residents and nearly 222,300 employees, has successfully planned for seven mixed-use, walkable, and bicycle-friendly Metro transit villages. High-density development is concentrated in two Metro corridors and accommodates 36 million square feet of office space, 6 million square feet of retail space, and over 47,000 residential units. Zoning and financing tools encourage development of affordable housing and enable amendments to site plans to allow creative and adaptive reuse of vacant office buildings. The tools routinely assess the need for community benefits. To maintain its commitment to the smart growth process, the county conducts a public review process every five years to assess the performance of the General Land Use Plan. Aerial view of the Arlington R-B Corridor. Photo courtesy Arlington County. 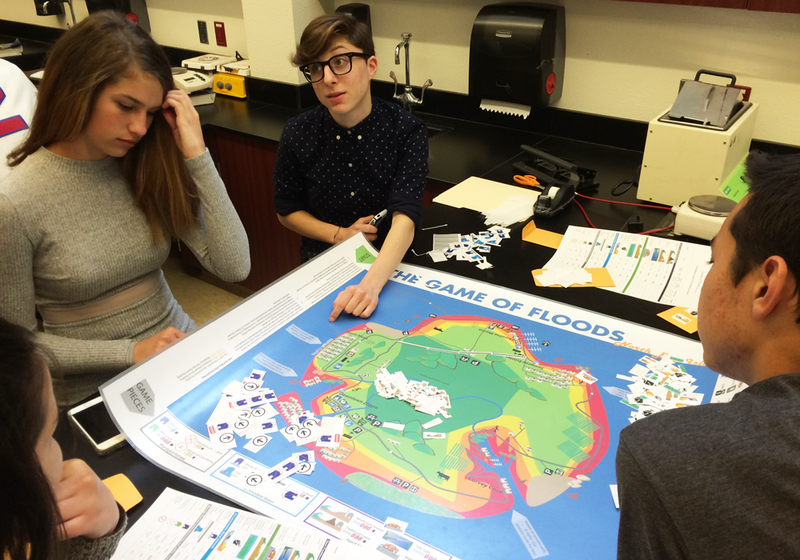 The Game of Floods combines gaming techniques with community planning exercises to communicate about sea level rise (SLR) vulnerabilities and adaptation in a fun, engaging way. Developed by the Marin County Community Development Agency and Department of Public Works, the game serves as a public education activity to encourage participants to design potential solutions for SLR challenges. Acting as planning commissioners, players are challenged to develop a 2050 vision for hypothetical Marin Island. The game board highlights future anticipated sea level conditions and increased storms causing loss or deterioration of homes, roads, community facilities, utilities, and other resources. Players move around the board, working together to discuss adaptation strategies, considering their effectiveness, impacts, and relative costs. Once the group reaches a consensus, it sticks measures on the board, finalizes recommendations, and tallies costs. The game is appropriate for individuals of all ages and encourages discussions among community members about sea level rise planning. It also helps educate residents about emerging environmental solutions that promote healthy, renewed, and resilient shorelines. Local teens play the Game of Floods in which they solve hypothetical community planning problems related to sea level rise. Photo courtesy Marin County, California. Montgomery County, Maryland's Bicycle Master Plan Stress Map identifies the stress levels encountered when cyclists navigate the 3,500 miles of roads and trails in the region. The stress map is accessible online so users may find the areas with the greatest amount of traffic stress. Levels range from very low (appropriate for children) to very high (appropriate for experienced cyclists). The map provides a data-driven approach to understanding bicycle connectivity by linking the traffic stress evaluation to the goals, objectives, and performance metrics outlined in the county's Bicycle Master Plan. The map also explains traffic stress to decision makers through videos, maps, and self-directed tools that allow cyclists to identify safer routes. The Bicycle Stress Map helped secure $6 million from the Montgomery County Council to fund a network of separated bike lanes in downtown Silver Spring — one of the first planned networks in the nation. Construction on the first separated bike lane began in September 2016, with the entire network to be built by 2020. 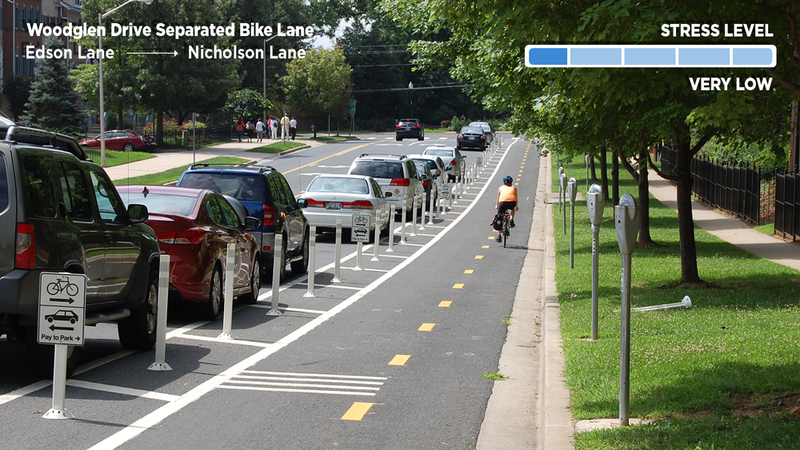 Clearly marked bike lanes provide a more enjoyable, and less stressful, biking experience for many riders. Photo courtesy Montgomery County, Maryland, Planning Department. 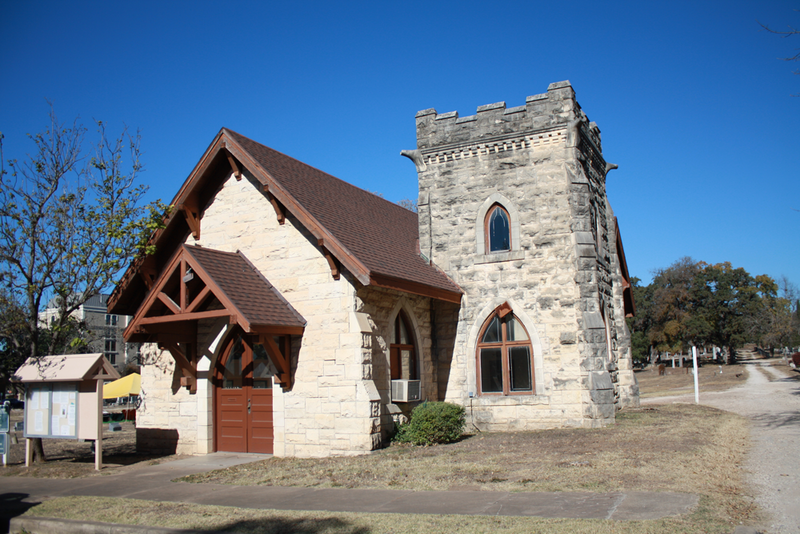 The Historic Cemeteries Master Plan provides a framework to rehabilitate and manage five cemeteries operated by the City of Austin, Texas. The plan combines best practices in preservation planning, urban design, and public engagement to transform historic cemeteries into civic open spaces that address the needs of surrounding neighborhoods. It also serves as a model for the revitalization of complex and sacred landscapes that can serve the living while honoring the past. With $2 million in capital improvement funding, the city has begun restoration of the 1914 Oakwood Chapel, which will house a visitor center and community space. Upon completion, the department will expand programming and tours of the cemetery properties. The plan promotes the development of accessible community gathering places and integrates citywide and regional green infrastructure, including cemeteries, into the urban environment and the transportation network. The plan also protects and enhances the unique qualities of Austin's treasured public spaces and, where needed, enriches those areas where the character has faded. Further, it promotes historic, artistic, cultural, and heritage-based tourism and helps strengthen Austin's neighborhoods, schools, parks, and other community facilities that are accessible by transit, walking, and bicycling. A $1 million restoration project is planned for the 1914 Oakwood Chapel, including renovated windows, a new roof, foundation improvements, and masonry cleaning and repair. Photo courtesy City of Austin, Texas.